We are reprinting here the November 2015 e-newsletter of WSP Eco Projects. Thanks to everyone who has used the Eco Map! We will continue to make improvements. You can share feedback with us via email at wspecoprojects@gmail.com or via social media @wspecoprojects. The Park has been in the news lately for the discovery of two 19th century burial vaults. These vaults were uncovered on University Place during excavation related to the City's water main connection project on the streets surrounding the park and on West 4th between the park and Broadway. The construction zone is now partly an archaeological dig and cultural artifact site. In light of the historic nature of the findings, we'd like to share some park history with you. Before Washington Square Park became a public park in 1827, it was a marsh fed by Minetta Brook, a potter's field (burial site for unidentified and poor individuals) during various outbreaks of yellow fever and other epidemics, and the Washington Military Parade Ground. Much of these events occurred on the eastern two-thirds of the site. The portion west of the present Washington Arch was acquired between 1825 and 1828. Between 1819 and 1892, Minetta Brook was first drained and then fully culverted to the Hudson River. There were major redesigns of the park between 1924 and 1938 and again in the 1990s and 2000s. DNAinfo.com first reported the story about a burial Vault found beneath Washington Square Park. In an update, we learned the two Vaults at Washington Square Park belong to One of Two Churches. The NYC Dept. of Design & Construction "Reconstruction Newsletter" detailing the water main connection project. In 2009, a tombstone dating from 1799 was unearthed in Washington Square Park during Phase II of the 2007 reconstruction project. A Brief History of the Minetta Waters in Washington Square park, 1797-1828. Untapped Cities wrote about a tour of Minetta Brook led by Steve Duncan. Steve provided the brook layer for the WSP Eco Map. Curious about the trees in the park? Here is a list of species growing in Washington Square Park. Although fall color in the park has reportedly peaked it's still a beautiful place. 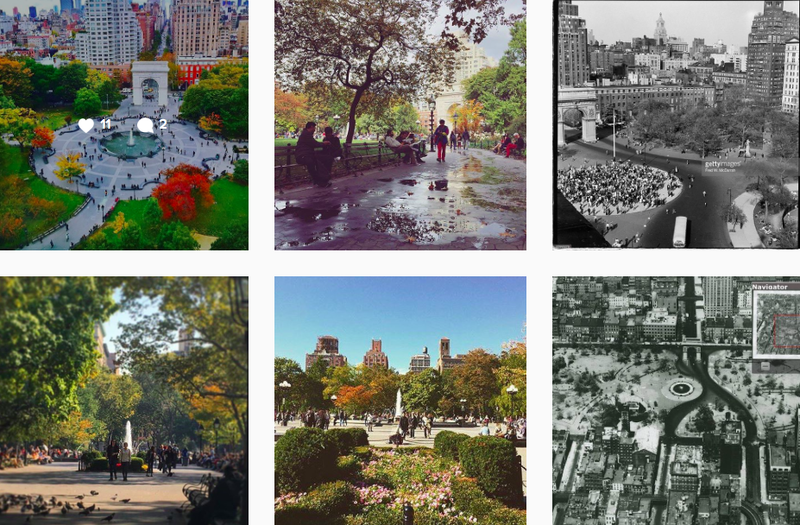 Use this guide to fall foliage in Washington Square Park (now)! Fabulous photographs and stories of the Washington Square Park red-tailed hawks can be found at the Roger Paw blog. Thank you for your support of Washington Square Park and WSP Eco Projects. Please feel free to share this newsletter with family and friends. P.S. In addition to the water main project, the sidewalks around Washington Square Park will be replaced. * This item was not included in the original newsletter.